Remember our four ways to create "out of 100" using arithmetic? Let's explore which help us change the format of numbers. We can change among decimal format, percent format, and fractions. What if we start in percent format and want to switch to decimal format? Write 47.1% as a decimal. We need to replace the % symbol using arithmetic. Which of the four versions of what percent means is the most helpful in this situation? Let's do more examples of changing from percent format to decimal format. Write 3% as a decimal. Write 30% as a decimal. Write 103% as a decimal. Write 10.3% as a decimal. Chapter 6 Test, Problem 1: Write 14.7% as a decimal. What if we start in decimal format and want to switch to percent format? Write 0.75 as a percent. Now we need to create the % symbol by "un-doing" one of those four options. Which of the four versions of what percent means is the most helpful in this situation? Let's do more examples of changing from decimal format to percent format. Write 0.04 as a percent. Write 2.3 as a percent. Write 0.375 as a percent. Write 0.66... as a percent. Chapter 6 Test, Problem 2: Write 0.38 as a percent. The acronym RIP LOP summarizes moving between decimal format and percent format. It stands for Right Into Percent, Left Out of Percent. Write 0.76 as a percent. Write 3.3% as a decimal. What if we start in percent format and want to switch to fraction format? Write 42% as a fraction. We again need to replace the % symbol using arithmetic. Which of the four versions of what percent means is the most helpful in this situation? Let's do another example of changing from percent format to decimal format. Write 80% as a fraction. In the previous two example we dealt with a whole number in percent format. What about changing a fraction or mixed number in percent format into a fraction not in percent format? Write 2 3/5 % as a fraction. Chapter 6 Test, Problem 4: Write 65% as a fraction. What if we start in fraction format and want to switch to percent format? Write 1/4 as a percent. We again need to create the % symbol by "un-doing" one of those four options. Which of the four versions of what percent means is the most helpful in this situation? The previous example worked so nicely because the denominator was a factor of 100. In general, a fraction may not be so friendly. Switching from fraction format to decimal format is usually a helpful intermediate step. Write 1/8 as a percent. Chapter 6 Test, Problem 3: Write 11/8 as a percent. Notice that our percent format answer may include a repeating decimal. Write 1/9 as a percent. Our next topic is percent sentences. These are the simplest word problems that involve percents. We will soon see that the key to doing difficult percent word problems is to first translate them into percent sentences before trying to write an equation. So percent sentences are both a kind of problem and a tool to solve other problems. A Percent Sentence is a short word problem that includes the words is, of, what, and %. Those four words can appear in any order. What is 35% of 60? 12 is what percent of 80? 5 is 2% of what? Notice that §6.3 and §6.4 are both about percent sentences. Look at the homework on pages 357 (§6.3) and 363 (§6.4). It looks exactly the same! Each of these two sections shows a different method for solving percent sentences. You only need to master one method. On the homework and on tests you can always do which method you choose. The textbook also translates the word percent into something. Don’t do this. It is simpler to move between decimal format and percent format mentally, with two decimal point scoots. Here is one more example problem before we consider the other method. 12 is what percent of 5? 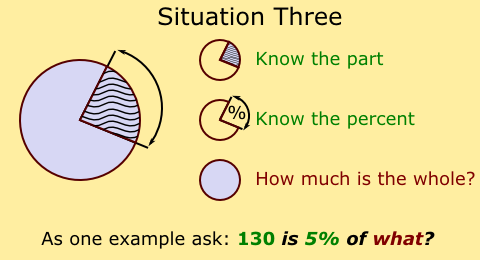 The second method is to write the percent sentence into a proportion. The steps are always the same. The bottom left is the value that follows the word "of"
Let's redo the same examples. Chapter 6 Test, Problem 5: What is 40% of 55? Chapter 6 Test, Problem 6: What percent of 80 is 65? Chapter 6 Test, Problem 21: 0.75% of what number is 300? "what" first: What is Y percent of Z? "what" second: Y is what percent of Z? "what" third: Y is Z percent of what? We could try to memorize rules for what arithmetic steps happen in each pattern. But this is too much work! It is much easier to simply learn either the Translation Method or the Proportion Method since those two methods can always be used. However, we should notice that in every patten the word "is" appears before the word "of". This is important! We like that! Not every percent sentence is friendly enough to have "is" appear before "of". All three patterns have an alternate form in which the "of" apperas before the "is". "what" first: What is Y percent of Z? — the same as "Y percent of Z is what?" "what" second: Y is what percent of Z? — the same as "What percent of Z is Y?" "what" third: Y is Z percent of what? — the same as "Z percent of what is Y?" It is not important to memorize how the three patterns have alternate forms. Both the Translation Method and the Proportion Method work in all situations. We are prepared! Yet when we write our own percent sentences (which will happen soon) we should be polite and always have "is" appear before "of". We will see that doing that makes our work much easier! Here is a trick that allows you to solve more percent sentences without needing to use a calculator. Impress your friends! Remember that when multiplying two number the order of the numbers does not matter. Also remember that "percent" merely means to divide by 100 at the end. Let's put these two facts together. The Switcheroo Trick is when we are multiplying a number in percent format by a normal number, and switch which number is the percentage. Here is an example. The translate method tells us that the prercent sentence "What is 4% of 50?" is simply 4% × 50. Finding 4% of a number might be tricky for you without a calculator. But finding 50% is easy—that is half of the number. So we switch which number is the percentage. 4 × 50% = 2. Recall the definition of a Percent Sentence. Here is a long word problem to translate into a percent sentence. In a recent survey, 58% of Edgewood students said they prefer tablets to laptops. If there are 300 Edgewood students, then how many students prefer tablets? There is more than one correct translation! Which percent sentences correctly translate the problem? How do we know they are right? 58% of what is 300? 300 is 58% of what? What is 58% of 300? 58% of 300 is what? While checking if a setup was correct you probably thought somewhat about "part" and "whole". Let's explore that line of reasoning very thoroughly. In every Math 20 word problem there is a part and whole. The part is always less than the whole. This means we can compare three situations. In the first situation we are trying to find the part as an amount. We know how big the part is as a percent. We know the whole. Therefore, when we try to change the word problem into a percent sentence the format will be What is blah % of blah?, where the two blahs are numbers we know. In the second situation we are trying to find the part as a percent. We know how big the part is as an amount. We know the whole. Therefore, when we try to change the word problem into a percent sentence the format will be Blah is what % of blah?, where the two blahs are numbers we know. In the third situation we are trying to find the whole. We know how big the part is as an amount. We know how big the part is as a percent. Therefore, when we try to change the word problem into a percent sentence the format will be Blah is blah % of what?, where the two blahs are numbers we know. Thinking about these three situations should help you read any Math 20 percent word problem and change it into a percent sentence. Real life can be more tricky. Not every percent word problem has a part that is less than a whole! For example, if my retirement account grows from $1,000 to $2,000 then it is not clear which is the "whole". But your textbook only assigns very traditional word problems. Your job is still to read the word problem identify the "part as amount", "part as percent", and "whole". Two of these will be numbers you know. The last will be something to solve for. But if you prefer the Proportion Method from §6.4 you can memorize that diagram and skip writing the percent sentence. Your turn to create a word problem solvable with a percent sentence. what first: What is Y percent of Z? what second: Y is what percent of Z? what third: Y is Z percent of what? As a group, follow these four steps. During the school year Eugene has a population of 180,700. The University of Oregon has 20,600 undergraduate students. What percentage of Eugene's school year population are undergraduate University of Oregon students? The University of Oregon has 20,600 undergraduate students and 3,800 graduate students. What percentage of the students at the University of Oregon are undergraduate students? Recall our six-step problem solving process. Let's augment this list of six steps to include the details of solving a word problem with a percent sentence. Translating the big word problem into a percent sentence involves naming the thing we are looking for. Changing the percent sentence into an equation can be done in two ways, as we discussed earlier. Remember to check if you need to round your answer. Always label your answer. So here is our final list of steps for problem solving with percents. Let's pick two problems to do from §6.5. Chapter 6 Test, Problem 8: Garrett Atkins, third baseman for the Colorado Rockies, got 175 hits during the 2008 baseball season. This was about 28.64% of his at-bats. How many at-bats did he have? Chapter 6 Test, Problem 10: There are about 6,603,000,000 people living in the world toay, and approximately 4,002,000,000 live in Asia. What percent of people live in Asia? Chapter 6 Test, Problem 11: The sales tax rate in Oklahoma is 4.5%. How much tax is charged on a pruchase of $560? What is the total price? Chapter 6 Test, Problem 12: Noah's commission rate is 15%. What is the commission from the sale of $4,200 worth of merchandise? The value might have a label. If it does we simply keep the label. A dollar sign can be such a label. The label on the second value might be a word. If there is a label that's a word, it still sticks around when we find a "percent of". Find 60% of 90 miles. Words being labels happens very often in word problems. William France's car can drive 396 miles on a full tank of gas. His gas tank is currently 15% full. How many more miles can he drive before he runs out of gas? Sometimes the label is another percent. This does not change anything. Keep the second percent as a label. What special cases are there for percent word problems? The textbook categorizes the word problems by topic (taxes, commission rate, etc.). But these are not special cases. They are all solved exactly the same way. There are only two special cases: simple interest and percent change. We will talk about those next. Interest is a fee the lender charges the borrower. For your savings account or a government bond you are charging the bank or government interest for the use of your money! For your debts, the bank or credit card charges you the fee. Simple Interest is a fee based upon a fee that is calculated only once, at the very end of the arranged time period. Nothing is unusual about a simple interest problem when the time frame is 1 year. An investment pays 4% simple interest per year. Fred invests $100. How much is it worth one year later? Chapter 6 Test, Problem 14: What is the simple interest on a principal of $120 at the annual interest rate of 7.1% for one year? But simple interest is designed for a one year time period. It becomes a special case when the time frame is not 1 year. Let's compare two different problems. You might need to multiply the "normal" answer by a number of years when simple interest happens for a longer time frame than the assumed one year. An investment pays 4% simple interest per year. Fred invests $100. How much is it worth five years later? You might instead need to multiply the "normal" answer by a fractional part of a year. An investment pays 4% simple interest per year. Fred invests $100. How much is it worth 200 days later? Chapter 6 Test, Problem 15: A city orchestra invests $5,200 at 6% annual simple interest. How much is in the account after half a year? The textbook really loves simple interest problems were the answer is the amount of interest. In fact, no textbook problems start by giving you the amount of interest and then asking for the fee as a percentage! Most students therefore memorize the shortcut formula. To find simple interest as a dollar amount, when given the original amount, interest rate, and time period, we can use a formula. Pleae be careful with this formula! It does not itself remind you that the Interest Rate needs RIP LOP, or that the Time is often a fractional part of a year. Similar to interest is a concept called appreciation. This is when an investment increases in value not because a fee is charged but just because the investment is worth more after time goes by. People often see appreciation in the value of their home, in the value of old furniture or jewelry, and in the value of the stocks in which they invest. In a slightly confusing manner, people use the simple interest formula I = P × r × t for both interest and appreciation. Just pretend that the appreciation's change in value is a fee even though it really is not. Percent change is a special case because very often a number you need is not explicitly provided. A candy bar that normally costs 75¢ is on sale for 60¢. What is the percent of the decrease? The textbook really loves percent change problems were the answer is the percentage. In fact, no textbook problems start by giving you the percentage and then asking for the change as a normal number! Most student therefore memorize a shortcut formula. Often this shortcut formula is written as a ratio, instead of as a division problem. The value of a house increases from $150,000 to $170,000. What is the percent of the increase? Chapter 6 Test, Problem 9: The number of foreign children adopted by Americans declined from 20,679 in 2006 to 19,292 in 2007. Find the percent of the decrease. Chapter 6 Test, Problem 13: The marked price of a DVD player is $200 and the item is on sale for 20% off. What are the discount (in dollars) and sale price? Chapter 6 Test, Problem 19: A television that normally costs $349 is on sale for $299. What is the discount in dollars? What is the discount rate? We recently learned the Simple Interest Formula. This formula is a great example to use for discussing how to approach a new formula when you are taught it in a future math class. First, be able to write the formula with words or with letters. In this case, be familiar with the formula whether it is written Simple Interest = Principal × rate × time or written as I = P × r × t.
Second, in your notes write some commentary about when to use the new formula. Do not try to use the formula in inappropriate situations! This formula is used for simple interest or appreciation. It does not work if the investor makes more than one deposit. It does not work when interest is paid before the very end of the time period. Third, add an example problem to your notes. You do not always need to solve the example problem. Even if you only write the problem without the solution this will still be useful as an example of when to use the formula you are learning. We might write, "My friend invested $900 and after 1 year it appreciated to be worth $945. What was the rate of appreciation?" Develop good habits. When you start to solve a problem by using a formula, list all the variables. This reminds you that you need to identify which amounts are known and which one is the unknown for which you are solving. It also shows you if any are intermediate values you need to use arithmetic to find, or if measurement units need to be fiddled to match appropriately. My friend invested $900 and after 1 year it appreciated to be worth $945. What was the rate of appreciation? As another good habit, solve for the unknown variable line-by-line while keeping items lined up in neat columns. This helps avoid "typos" when writing the next step. Some formulas (especially those with exponents or nested parenthesis) are tricky to type into your calculator. Practice using your calculator with the new formula. Finally, when you learn a new formula practice solving for every variable in it (except an exponent, since you do not yet know the math to solve for those). In other words, for each letter that is not an exponent, pretend you know all the others and then try to solve the equation. Then no matter what variation you encounter, you will be ready to use the formula to solve for the missing amount. If the original amount and the percent change are given to us, finding the new amount takes two steps. First we find the amount of change. Then we add or subtract from the original amount to find the new amount. Consider the situation where you put $200 in the bank for a year and earn 3% annual interest. We want to know how much money is in the bank at the end of the year. As we have seen, if we use percent change then the initial $200 disappears. We must add it back in as a second step. An investment of $200 increases by 3%. What is the new total? We ask ourselves, "What is 3% of $200?" and translate. Then step two to put back the original amount. Similarly, if we use the simple interest formula the initial $200 also disappears. We must add it back in as a second step. Those two-step problems were not too bad. But there is a shortcut! Here is an elegant trick. If we change the interest rate by adding 1 (because 1 = 100%, so it represents the original whole) then the exact same procedures provide the total amount in the bank. We ask ourselves, "What is 103% of $200?" and translate. Usually we do not write the first equation. It is so easy to add 1 to a decimal that we can do that in our heads and start writing at the second line. Note that I no longer corresponds to "interest". If you prefer, change it to an F for "final amount", or a T for "total". The "one plus" trick works for any problem about percent increase. It keeps the original amount included as part of the answer. The "one plus" trick is very handy if we need to work backwards. It is easier to go backwards one step than two! An investment currently worth $940 has appreciated by 5% during the past year..What was it worth a year ago? For a percent decrease problem we can use the same trick but it looks slightly different. We still add one, but since the change is negative we need to subtract the percent from 1. It becomes the "One Minus Trick" instead. An investment of $200 decreases by 15%. What is the new value? Be Alert to "What is..." Versus "What percent of...?" The Translation Method showed us that percent sentences that start with "What is..." involve RIP LOP and multiplication. What is 30% of 200? First translate, using RIP LOP to move out of percent. A different situation is when a word problem starts with "What percent of...?" These can be solved the ways we learned above, changing them into a percent sentence and then using either the Translation Method or the Proportion Method. In a tank of 10 fish, 8 are guppies. What percent of the fish are guppies? First make into a percent sentence. Ask, "8 is what percent of 10?" Then solve. Let's use the Translation Method for the sake of brevity. But it is usually quicker to think of them as a fraction. Look for a part divided by a whole. Here is a trick: the whole always follows the word of. Consider the part and whole. Write this as a fraction, then change it into a percent.